The App Store app updates mechanism is somewhat cumbersome and disconnected from the apps themselves. Users often fail to notice when new versions of an app are released, and if they do notice, the App Store's "download all" option means that users often won't see the release notes for the new version. Whilst it is not possible to bypass the App Store and update an app from within the app itself, as this violates the App Store terms and conditions, there is no reason why an app should not inform the user that the new release is ready, and direct them to the App Store to download the update. iVersion is a simple, drop-in class to allow iPhone and Mac App Store apps to automatically check for updates and inform the user about new features. 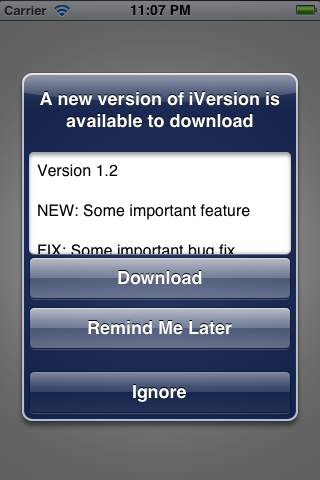 iVersion has an additional function, which is to tell users about important new features when they first run an app after downloading a new version. NOTE: iVersion cannot tell if a given release is available to download, so make sure that you only update the remote versions file after Apple has approved your app and it has appeared in the store. One way to do this automatically is to replace the remote versions file with a web service that dynamically polls the iTunes app page for your app and scrapes the version number and release notes. A sample implementation of such a service (written in PHP) is included as an example.